If you live in an area where your lowest temperature in the winter is expected to be minus 5 degrees F or colder, it is necessary for you to protect your climbing rose bushes in the winter. Climbing roses do not twine like other vines or have any form of suctioning roots. They must be tied to a support and taken down during the winter. Make sure to bring in new soil to protect your roses during the winter, rather than soil scooped up from around your bushes. Stop fertilizing your climbing roses in the late summer or early fall. This discourages any new growth that might not survive through the winter. Clean the area underneath the roses. Remove all plant debris that has fallen to the ground and remove any dead or diseased parts of the plant. 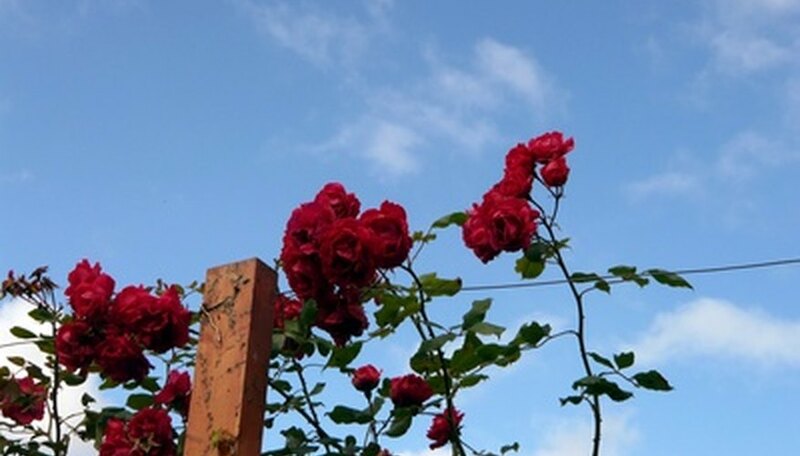 Prune your climbing roses by removing any damaged canes, dead canes or canes 2 years old or older. Removal of the canes will help in the winterization of the plant. Newer growth produces the best blooms, so take care when pruning your roses and use hand shears to cut the canes at a slight angle. Untie the climbing rose bush from its support and lay it on the ground. Stake the bush in place on the ground to help protect against any wind damage during the winter using metal or wood stakes. Cover the roses with burlap or other insulating materials such as old quilts or bed sheets. Place 1 foot of soil on top of the insulating material and cover with 2 to 4 inches of mulch.